Many of you are well aware of the tragic event that occurred less than two weeks ago in Newtown, CT. My heart goes out to the families of the innocent victims, and I pray that the Lord brings them healing in their time of sorrow. In memory of the lives lost that tragic day, I have made a card with a digi so graciously provided by Betty of Simply Betty Stamps. Betty drew this beautiful angel and has offered it to anyone wanting to make a card (or cards) to be sent to Sandy Hook Elementary. All you need to do is join the Simply Betty Group on Facebook. She occasionally gives out freebies, and the gals there are really great. So, be sure to check it out. I decided to go with a simple card using a white-on-white color scheme. The white background cardstock was embossed with a Swiss Dots embossing folder. 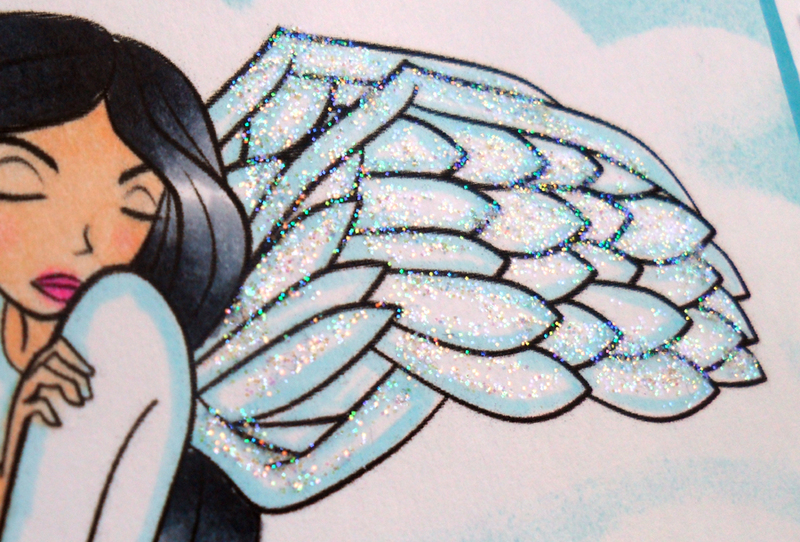 The angel was colored with Copics and her wings Stickled to add sparkle. I wanted the angel to look even more heavenly, so I decided to add clouds. I used a cloud template that I've had for many years. It's definitely one of the handiest tools I have. I used it to sponge the clouds onto the background with Tumbled Glass Distress Ink. I first made sure to print a duplicate image of the angel and then cut it out to use as a mask before sponging. This protected the main image from being sponged while adding the clouds. I then finished off the card with a simple white ribbon bow. I really love this image and will definitely be using it again in the future, not just for sympathy cards but also for cards with scripture quotes as well. Thank you for stopping by. If you feel so inclined, please take a moment to say a prayer for those affected by the Newtown incident. I appreciate all of you who take the time to stop by my blog. I wish you all a safe and merry Christmas filled with love, peace, and joy. Aloha! The card is beautiful. Have a blessed holiday season. Great coloring job, loving the glitter on the wings.